Researchers studying rats have solved the mystery of why type 2 diabetes sometimes disappears after gastric bypass surgery—even before weight loss occurs. Though existing research has shown that gastric bypass surgery resolves type 2 diabetes, the reason has remained unclear. A research team led by Nicholas Stylopoulos, HMS assistant professor of pediatrics at Boston Children’s Hospital, has identified the small intestine—widely believed to be a passive organ—as the major contributor to the body’s metabolism, based on a study in rats. The report appears in the July 26, 2013, issue of Science. Weight loss and improved diabetes often go hand in hand, but type 2 diabetes often disappears even before weight loss occurs after gastric bypass. To investigate why this happens, Stylopoulos and his team spent one year studying rats. They observed that after gastric bypass surgery, the small intestine changes the way it processes glucose. The team saw the intestine using and disposing of glucose, thereby regulating blood glucose levels in the rest of the body and helping to eliminate type 2 diabetes. Gastric bypass surgery, a weight-loss treatment typically reserved for severely obese patients, reroutes food into a small pouch of the stomach and bypasses the rest of the stomach and duodenum. Before gastric bypass, intestines typically do not contain GLUT-1, a specific transporter responsible for removing glucose from circulation and utilizing it within the organ. After gastric bypass, the researchers found that the intestine reprograms itself to contain GLUT-1, taking glucose from circulation and disposing of it, swiftly stabilizing blood glucose levels in the rest of the body. 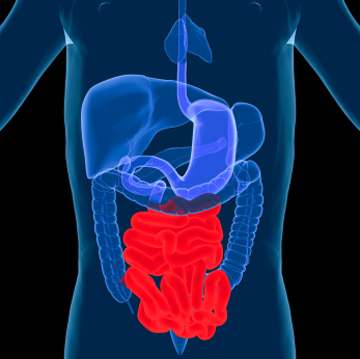 “Previously, we had not considered the intestine as a major glucose-utilizing organ. We have found this process is exactly what happens after surgery,” said Stylopoulos. Based on their findings, Stylopoulos and his colleagues found that type 2 diabetes was resolved in 100 percent of the rats that underwent gastric bypass. Sixty-four percent of type 2 diabetes was resolved by the intestine, and the researchers hypothesize that the remaining 36 percent may be due to weight loss or other factors. This research was supported with funds from the National Institutes of Health and the Division of Endocrinology, Department of Medicine and the Clinical and Translational Executive Committee at Boston Children’s Hospital. Adapted from a Boston Children’s Hospital news release.